WASHINGTON — The trade war that erupted Friday between the U.S. and China carries a major risk of escalation that could weaken investment, depress spending, unsettle financial markets and slow the global economy. These initial tariffs are unlikely to inflict serious harm to the world’s two biggest economies. Gregory Daco, head of U.S. economics at Oxford Economics, has calculated that they would pare growth in both countries by no more than 0.2 percent through 2020. Escalating tariffs are likely to slow business investment as companies wait to see whether the administration can reach a truce with Beijing. Some employers will probably put hiring on hold until the picture becomes clearer. The damage could risk undoing some of the economic benefits of last year’s tax cuts. The root of the conflict is the Trump administration’s assertion that China has long used predatory tactics in a drive to supplant America’s technological supremacy. Those tactics include cyber-theft as well as forcing companies to hand over technology in exchange for access to China’s market. Trump’s tariffs are meant to press Beijing to change its ways. The rift with China is the most consequential trade conflict the administration has provoked. But it’s hardly the only one. Trump is also sparring with the European Union over his threat to tax auto imports and with Canada and Mexico over his push to rewrite the North American trade pact. And he has subjected most of America’s trading partners to tariffs on steel and aluminum. Christine LoCascio, an executive at the Distilled Spirits Council, said she fears China’s tariffs on U.S. whiskey will “put the brakes on an American success story” of rising exports of U.S. spirits. 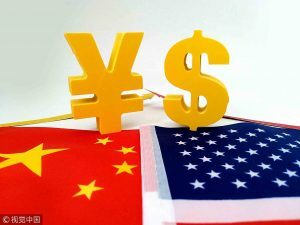 China’s currency, the yuan, has dropped 3.5 percent against the dollar over the past month, giving Chinese companies a price edge over their U.S. competition. The drop might reflect a deliberate devaluation by Beijing to signal its “displeasure over the state of trade negotiations,” according to a report from the Institute of International Finance, a banking trade group. The administration has placed “these import taxes squarely on the shoulders of manufacturers and, by extension, consumers,” Souhrada said. Jason Mayberry, Bobcat’s assistant general counsel, said in a filing submitted to the U.S. Trade Representative’s office that the company would have to raise prices to offset the tariff. Bobcat’s raw material costs have also risen because of the administration’s steel and aluminum tariffs. And if Trump extends the tariffs to up to $550 billion in Chinese imports, consumers won’t be able to avoid getting caught in the crossfire: The taxes would hit products like televisions and cellphones. That’s what happened to imported washing machines, which were hit by separate Trump tariffs in January. Over the past year, their price has surged more than 8 percent.